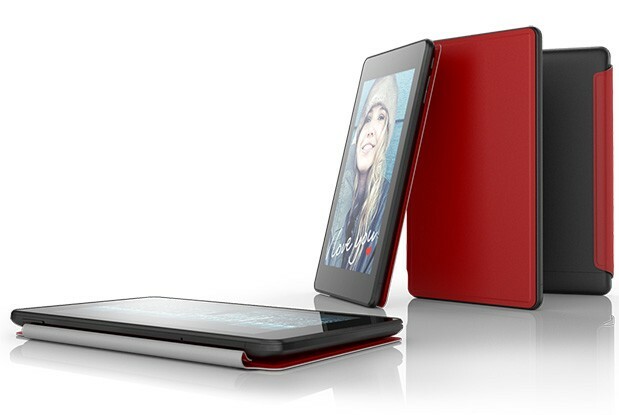 Hot on the heels of their phone announcement Alcatel dropped some new tablets too! The Alcatel One Touch Evo 7 HD. These two tablets are Alcatel's first real venture into the tablet market, so you're probably wondering what's on offer. Well you may be pleasantly surprised because the Evo 7 HD, which is pictured above, comes with a 7-inch WXGA, that's 1,280 x 800 display, 1GB RAM, a dual-core 1.6GHz processor and Android 4.1. As well as that you'll be getting 4GB of internal storage and thankfully you can expand that via a microSD card. Alcatel also hindly added a pair of camera; the front-facing one which you'll probably use most often is a VGA camera and the rear one is a 3-megapixel option. On the connection fron there's Wifi 802.11 b/g/n and you'll be getting Bluetooth 4.0! Although this is a Wifi only tablet Alcatel has a removable 3G module which you can buy with the tablet at a slight additional const. If it's the Evo 7 HD which you're after then it'll be available in May for $179, for the base Wifi only model, if you want that 3G stick then it'll come to a total of $249 and if you really, really want 4G then you can buy a stick for that too, which when bundled with the tablet will cost $349! The Alcatel One Touch Evo 7! So will the cheap Evo 7 still the HD's thunder? Not quite. The device features a 7-inch WSVGA, that's 1,024 x 600, display, 1GB of RAM, a single-core 1GHz processor and Android 4.0. On the front you'll have that same VGA camera, but there's no rear option this time. You do get the same 4GB of internal storage and a microSD card slot. The connection options of the One Touch Evo 7 take a bit of a cost cutting hit too; there's still WiFi, but Bluetooth is downgraded to version 2.1 and you can only have the optional HSPA+ 21 module. At the moment there's no price or release date information available! 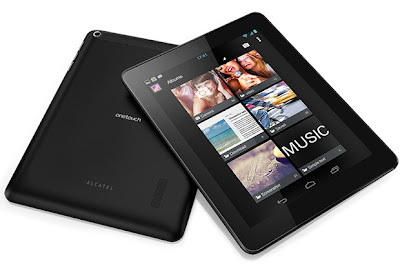 The Alcatel One Touch Tab's: 7, 7HD and the 8HD! Wow, there we were thinking Alcatel's naming convention couldn't get any longer or more confusing, but boy were we wrong. So the Evo tablets are Alcatel's more expensive options, but these Touch Tabs are the budget versions, but they're pretty respectable devices nonetheless. It's worth saying out of the gate that none of these tablets have the mobile data connectivity options, so they're all confined to Wifi and these devices have Bluetooth 2.0, but o the plus side they will all arrive preloaded with whatever Google's latest operating system is in Q3 of this year! So lets start with the One Touch Tab 7 HD and the 8HD. These tablets have quite a lot in common; they both share a 1.6GHz dual-core processor, 1GB of RAM, 8GB of internal storage, with microSD support, a 2-megapixel rear camera and a front-facing VGA shooter. But, the One Touch Tab 7 HD is priced at $149 and that'll buy you a 7-inch WXGA, 1,280 x 800 resolution IPS display, whereas the One Touch Tab 8 HD features an 8-inch XGA, 1,024 x 768 pixel resolution IPS display and can be all yours for $179. At the lowest end of this set of tablets is the $129 One Touch Tab 7. 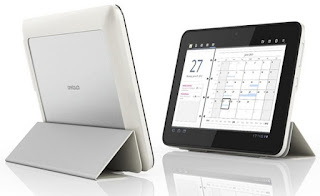 The tablet has a 7-inch WSVGA, 1,024 x 600p resolution TFT display, 1GB of RAM and a single-core 1GHz processor. There's only a front-facing VGA camera on this bad boy and you'll only get 4GBof internal memory but, you will still get a microSD card slot. For $20 more we would whole-heartedly recommend buying the HD option, unless your budget really can't stretch!